Today, I closed on the 2.5 acre lot. Everyone at the closing was remarking in amazement at this deal. At approximately $1,000 per acre, this was truly a deal. Even in rural areas where land is cheap, one would be hard pressed to come anywhere close to $1,000 per acre. So for this lot to be obtained at this price when it’s only 10 miles from downtown Atlanta, it is truly a bargain. The seller’s agent told me that I had submitted my offer just in time. Apparently the day after my offer was accepted, he received a call from someone inquiring about the lot. When he asked the interested party what they intended to do with it, they said they were thinking of buying it and putting a container home on it. My realtor got word today that my offer of $3,000 for the 2.5 acre lot has been accepted! Here’s a Google Map view of the lot. It is the one that looks like a closed right hand with index finger extended in a pointing gesture. 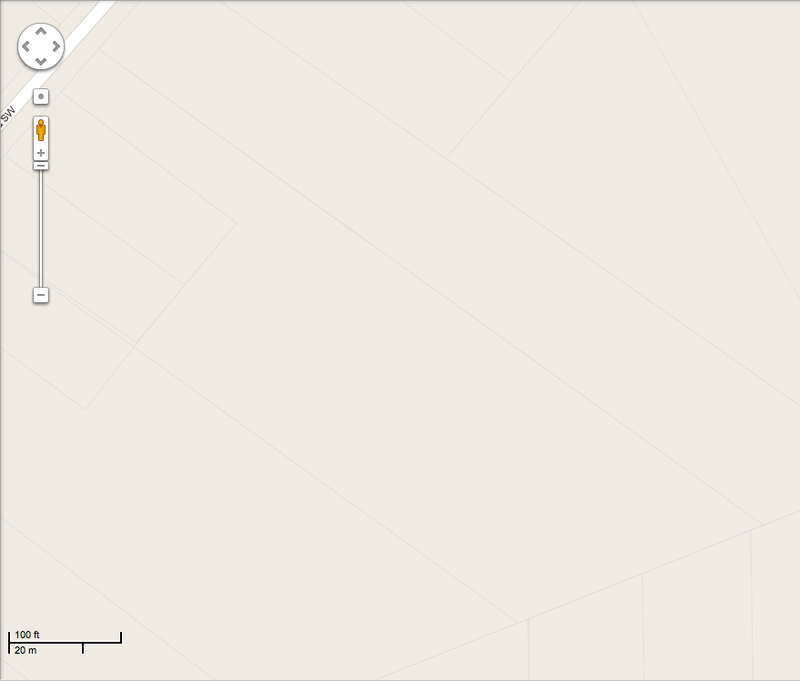 Here’s the Google Map satellite view of the lot. I went and walked the lot today with my friend Ed. The lot appears to be heavily used by wildlife since we saw lots of deer dropping. This could be my own small wildlife sanctuary. I’ve been wanting a place to practice air rifle shooting. With the typical 50 feet x 150 feet urban lots, air rifle shooting is simply not possible. With the size and the privacy of this lot, I can definitely come here to practice. The purchase of my first empty lot really got me interested in the value of land for my self-sufficiency projects. With the housing collapse, there is little interest in land since most people on see land as something to build a house on. Since homes can’t be built right now for less than market value, the value of land has dropped considerably. Just as speculators have been dumping homes as they have dropped in value, the same is occurring for land lots. This combination of increased supply and decreased demand has made prices of some empty urban lots extremely attractive. When I made my previous purchase, I thought I scored a rare find of 0.75 contiguous acre just 5 miles from downtown Atlanta and at a reasonable price. Today, I decided to search for vacant lots again but at a slightly larger radius from my home than previously searched. To my amazement, I found an amazing lot for sale. While this lot is further from my home it is still just a short ten minute drive away. Located 10 miles from downtown Atlanta, this wooded 2.5 acre lot is on a quiet residential street was listing for $4,000. I drove over to view the lot during my lunch break and didn’t see anything that would be cause for concern. 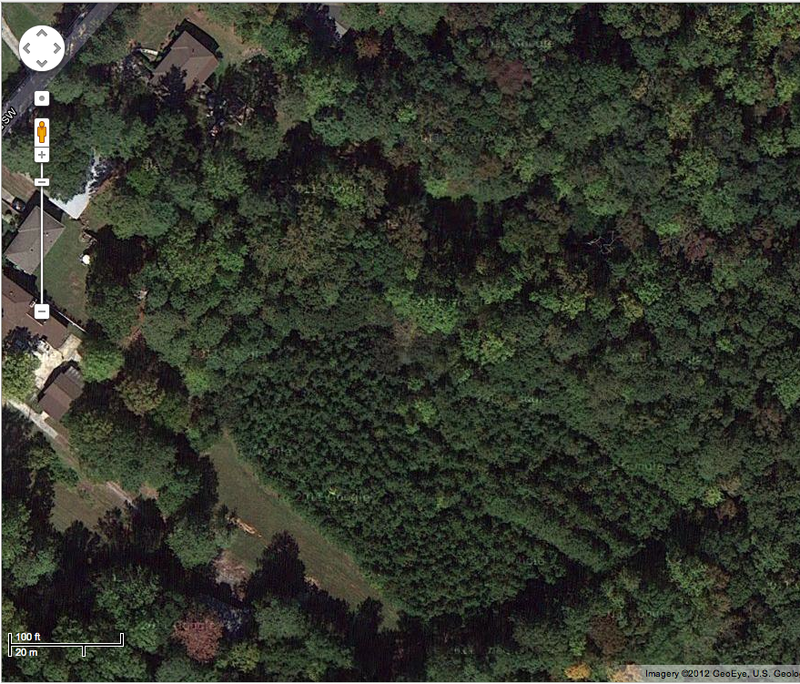 The lot, while wooded, was mostly covered by very small trees and saplings, most of which could be easily taken down. The majority of the lot was hidden behind other street lots. This, combined with the abundance of small trees gave it a lot of privacy. The lot seemed to also be fairly level. For the price that it was listing at, even if I never did anything with it, it would make an even better dog park than the lot I just purchased last Friday. I immediately called my realtor and asked her to find out if the property was still available. An hour later, she called me back to report that it was and I asked that she submit an offer of $3,000 for this 2.5 acre lot. I am hoping that since the listing has been active for a very long time, the bank will be eager to let it go. My realtor still thinks I am crazy for wanting to buy up empty lots and turning them into orchards and dog parks. However, even she admits that this one would be a steal! Today, I closed my purchase of two adjacent bank-owned vacant lots which are just minutes from my home and less than 5 miles from downtown Atlanta. I’ve had my eye of these lots from several months prior. One large, 0.56 acre lot sits in the middle of all the street facing lots on the four surrounding blocks. Another adjacent, regular-sized, 0.19 acre lot sits perpendicular to it. The large lot gets full sun for the majority of the day which made it ideal for growing. I had originally planned on starting a community garden but then gave up on the idea when I found out that neither lots had water service. After some consideration, I decided that it would be feasible to grow fruit trees instead. The thought was that the trees would need watering initially for the first one or two years but after that they would be able to meet their own water needs through their established root system. Transporting of water to the lot seemed doable since I lived less than a mile away. From this the orchard idea was born! Even if the idea did not work out, I thought at the very least I will end up with a private dog park just minutes from my home where I can bring my four dogs to run free. I also scheduled to have the lots surveyed today. 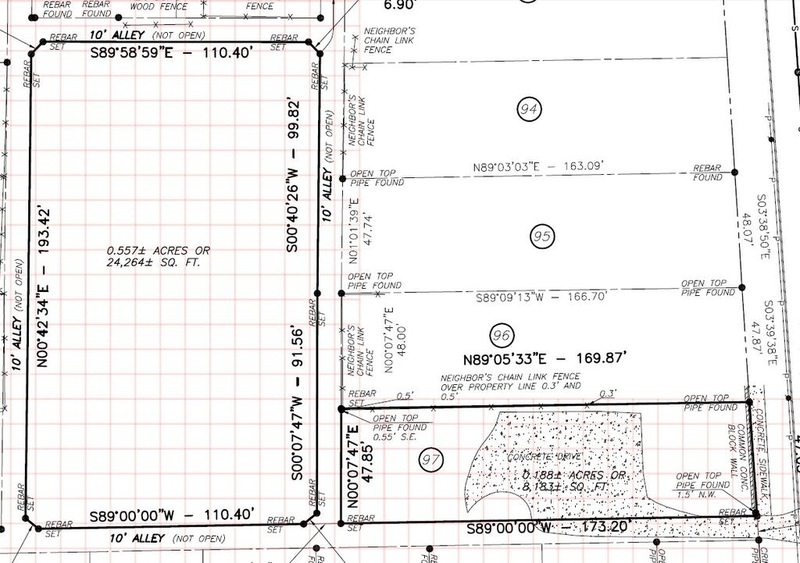 I plan on fencing in the lot so it is necessary to know where the property boundaries lie. Survey was completed today and an electronic copy has already been sent to me. I’ve added an overlay of 10 foot square grids so I can start planning my orchard. This blog will document my journey towards self-sufficiency. I’ve always had an interest in living a more self-sufficent lifestyle and recently arrived at a point in my life where I can finally dedicate some time and the resources to this passion. I started this pursuit in July 2011 with the goal of removing my dependence on meat from industrial farming due to its negative impact on human and animal health. This first step lead to the raising of meat rabbits. By Thanksgiving 2011, I had completely replaced my meat source with meat rabbits that I raised on my own. Since then, I have only purchased meat from the stores for my dogs’ raw meat diet. Shortly after I started raising meat rabbits, in Fall of 2011, I started a barter arrangement with two friends who run two different community gardens in nearby neighborhoods. On a weekly basis, I supply them with the manure from my rabbits and in return they supply me with fresh, organic vegetables grown in their garden. Soon, I was no longer purchasing my vegetables from the stores. The beauty of the symbiosis further spurred my interest in self-sufficiency. No longer purchasing meat and vegetables from stores, I became interested in growing my own fruits, as well. Since fruit trees require lots of sun and space, I concluded I would need more space than my urban backyard to pursue this successfully and soon I came up with the idea of growing my own orchard on a vacant lot. There’s lots left to be done and I hope others will enjoy sharing in my journey.